Lightly grease or line one cookie sheet with parchment; set aside. Combine Bisquick with cold butter in a medium bowl using a pastry cutter (I just used 2 forks). Don’t worry about mixing too thoroughly; there will be small chunks of butter in the mix about the size of peas. Add cheddar cheese, milk, and garlic powder. Mix by hand until combined, but don’t over mix. Drop 1/4 cup portions of the dough onto the lightly greased or parchment lined cookie sheet. Stir in garlic powder and dried parsley flakes. Sprinkle a little kosher salt on the freshly coated biscuits. I made this dish the other night along side the roast chicken and green beans mentioned in my previous post…it was pretty yummy! Who doesn’t love roasted garlic??? Transfer stuffing to baking dish, cover with foil, and cook for 25-30 minutes. Uncover and bake till top crisps slightly, 5 to 10 minutes more. So when I was at Kroger the other day, I was trying to decide which bread to buy for sandwiches. 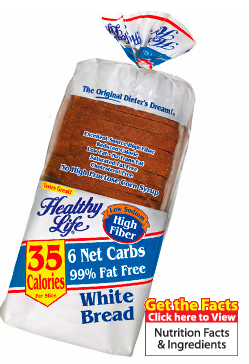 I initially planned to buy some whole wheat bread, when I stumbled across Healthy Life Bread – White. 2 slices have 70 calories, .5 g fat, and 4 g of fiber…that’s only 1 ww point for 2 slices (and subsequently 0 points for 1 slice!) And, it tastes like normal white bread! I know whole wheat is better for you, but I like the taste of white better, personally. But if you still don’t want white bread, they also have all sorts of whole grain and other options. You can check it out by going to their website. So, I am trying to make recipes from my Cooking Light cookbook more often, but tonight I decided to indulge some and make some recipes from “The Pioneer Woman,” (see link to her blog on the left). 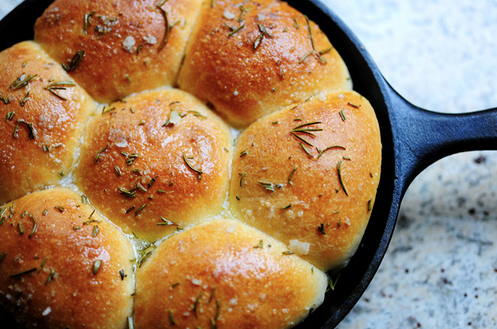 I made Ranch Style Chicken, Twice Baked Potatoes, and Buttered Rosemary Rolls. Boy, was it delicious! Note: as listed, these recipes serve more than one person; I modified them when I made them to serve the two of us, but just copied her recipes as they were for easy viewing. Also, you may just prefer to click the above links, and she gives a step by step guide (with pictures for each step) on how to make the dishes. In a large bowl mix together Dijon with honey, juice of lemon, paprika, and salt and whisk until smooth. Sprinkle in some crushed red pepper flakes or cayenne if you like; set aside. Next, rinse the chicken breasts, place between two sheets of waxed paper and pound to around ½ to ¾ inch thick with a mallet. Next, add the chicken to the bowl with the marinade, cover with plastic wrap and place in the refrigerator for 1 to 3 hours. While the chicken marinates, fry up some bacon. When finished cooking, reserve ¼ cup of the bacon grease and clean out the skillet. When the chicken is done marinating, preheat the oven to 400 degrees. Remove the chicken from the fridge and pour off excess marinade. Heat half of the reserved bacon grease with an equal quantity of Canola Oil in the clean skillet over medium-high heat. When the grease is nice and hot add two or three pieces of chicken to it. Cook until brownish/blackish, about 1 to 1 ½ minutes per side. Remove chicken to a large baking sheet. (If cooking many pieces of chicken, repeat skillet process and remove finished chicken to baking sheet). Place chicken in preheated oven and cook for about 10 minutes. Remove from oven. 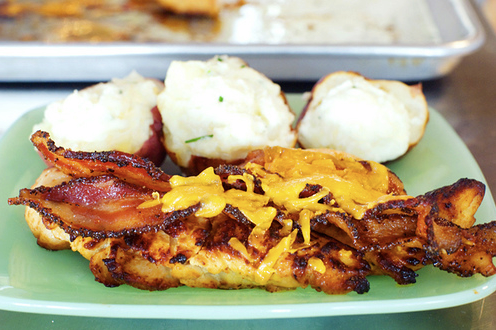 Lay a few pieces of bacon over each chicken breast. Sprinkle cheese over the top of the chicken as generously as you like. Return pan to oven for an additional five minutes until cheese is melted and bacon is sizzling. Serve immediately. *You can click on the link above for specific measurements, but basically, these are ingredients you can eyeball. Once done, take potatoes out of oven, and reduce heat to 350. After baking, potatoes will be hot. Holding each with a towel (to prevent your hands from burning), cut each potato in half. Scoop the contents out of each shell into a bowl. 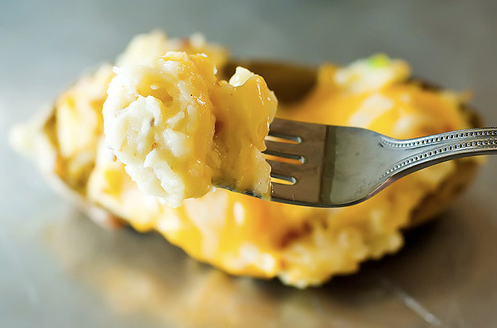 Mix the potatoes with other ingredients, and mash together. Bake in 350 degree oven for 15-20 minutes. Bake according to roll package directions, until rolls are a deep golden brown on top. So, this isn’t a recipe so much as a product suggestion. 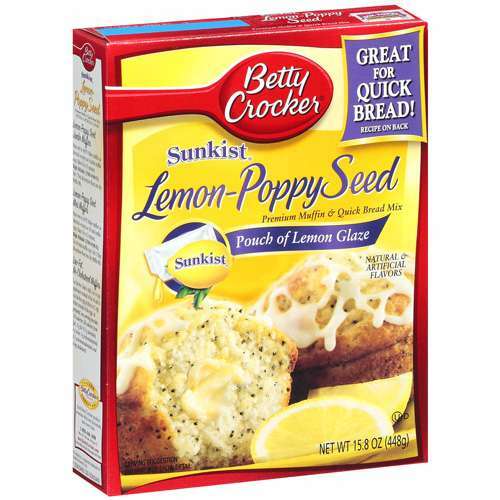 The other day, when at Walmart, I stumbled across a Betty Crocker Lemon-Poppy Seed Muffin/Quick Bread mix. I decided some lemon-poppy seed bread sounded good, so I bought it. The quick bread recipe is on the back (on the bottom, under the muffin recipe); in addition to the mix, it called for eggs, flour, vegetable oil, and maybe a thing or two more. But, you can find the ingredients listed on the back if you buy it yourself. Anyways, since our oven gets overly hot, I cooked it a little bit too long, so it was too done around some of the edges, but it still turned out pretty good. It even gives you a “recipe” for some lemon butter you can put on it! Sure sounds yummy to me…I’ll have to make it soon!